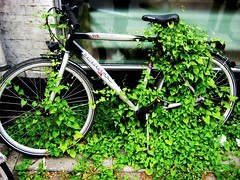 I've been watching this bicycle for over three months. It's right across the street from my flat, on a stretch of bike lane outside a hospital. In other words, not a residental stretch. It appeared there, leaning against the steel post over three months ago. The back tire was flat and it was locked with the wheel lock. I'm assuming someone got a flat and parked it, maybe hopping on on a bus or the metro to continue their journey. It remained unmoved for several days. Then it started shuffling about. People were obviously having a look at it. Checking it out. Nothing happened to the bike, but it was being shuffled about. Suddenly leaning up against the wall one day, then back against the post. Anonymous hands moving it about. After about a month, the front wheel was removed, but it wasn't taken. It was left leaning up against the bike. A week or two later, the tire was taken off the wheel and spirited away. The bike was still constantly in movement within this little area. Almost every day or two it was in a different position. I never saw anyone moving it and only saw one regular looking man stop up to check it out. Actually, I did see a city employee sweeping leaves move it out of the way, but that's it. About three weeks ago, the front tire was gone. Then the seat. 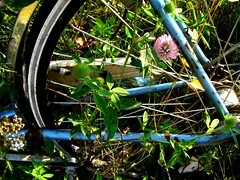 The bike is still there as I write this. 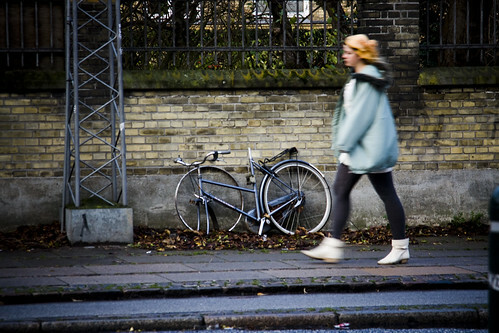 The attitude towards bicycles really is that they are, in many ways, public domain. 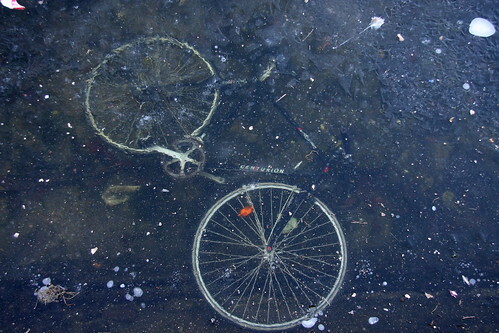 The bike was not cannibalised for quite a long period. Then perhaps as the same people started walking past and seeing it still there, bits and pieces started to disappear. A kind of biodegradable process, like bugs and birds picking slowly away at a corpse. The bicycle is just a tool. A thing. An amazing thing, but just a thing. If you have a nice thing, you take care of it. If you have a regular thing, you're more flexible about it. I've discovered that this disposable attitude to bicycles is hard for many people in Emerging Bicycle Cultures to understand but it's important to consider when bicycling becomes mainstream. 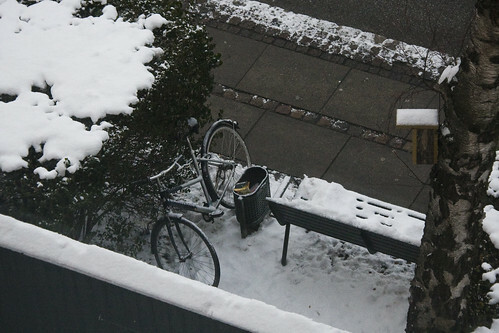 In contrast, the chain fell off this bicycle a few days ago, outside my flat. It was locked by the bush for a couple of days and then was gone. Picked up by the owner is my assumption. Elsewhere the assumption would be that it was nicked. The very excellent Canadian film Monkey Warfare, which takes place in Toronto, tackles this disposable bicyclism in much the same way. 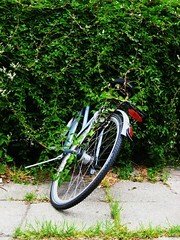 An abandoned bike is left alone until the characters are sure that it is, in fact, abandoned.